We take another look at some of the great rivalries that have prevailed over the years of the UFC. Even the most humble of fighters such as B.J. Penn and Matt Hughes have had some great feuds that could questionably rival vendettas from the likes of Chuck Liddell and Frank Trigg. My previous article (The Top 5 UFC Rivalries) certainly got the MMA community talking about their favourite UFC rivalries, I thought it would be remiss of me to not mention some of the most conversed rivalries by our readers. So, here we go, round two of some of the greatest rivalries in the UFC. When Chuck Liddell became the number one contender for Tito Ortiz’s title everything changed. Training partners and friends they were no longer. The feud began in 2002 when Ortiz refused Liddell a shot at the title due to “conflicts”. Liddell accused Ortiz that he was trying to obstruct the inevitable fight, which would happen two years later at UFC 47. Ortiz lost via TKO in the second round. They met again for a re-match at UFC 66 and Ortiz lost in the same fashion. It was certain that we would see a part three. In 2010, Ortiz and Liddell coached in The Ultimate Fighter: Season 11. They were scheduled to fight, however, Ortiz pulled out due to an injury that required surgery. The war of words continued and Liddell condemned Ortiz for avoiding the fight. The much yearned for trilogy has not taken place since and is unlikely that we will ever see it given Liddell has now retired from the UFC. That said, given the opportunity, however, something tells me that Liddell would take the fight in a heartbeat should he be given the opportunity. Trigg challenged Hughes twice for his welterweight title and both times he was defeated in the first round via a rear naked choke. The first round of their second fight is arguably the most exciting first round that the MMA community has ever seen. Before the fight had commenced, Trigg went nose-to-nose with Hughes then proceeded to blow him a kiss. Naturally, rubbing up Hughes the wrong way, he responded by shoving Trigg and at that moment, we knew we were in for one hell of an entertaining fight. In the centre of the cage they exchanged punches. Trigg caught Hughes with a knee to the groin that was not caught by referee Mario Yamasaki. As Hughes tried to regain his composure, Trigg saw an opportunity, swung a left hook which sent Hughes to the ground. Hughes was in serious trouble as Trigg unleashed a barrage of blows and found the mount position. As Hughes tried to maneuver his way out from underneath Trigg, he made a mistake and gave his back which landed him in a rear naked choke. When Hughes’ face turned bright red, we all thought it was over, however, he shocked us all and escaped. Moments later, Hughes picked up Trigg, carried him across the cage and dropped him on his back. At the end of the first round, Trigg found himself in a rear naked choke and conceded a second defeat. To this day, Hughes and Trigg despise each other and dare I say that these two will never kiss and make up. B.J Penn and Georges St-Pierre (GSP) first met in the Octagon at UFC 58 but it was not until UFC 94 when it all came to a head. After GSP won their first fight via split decision, Penn dropped into the lightweight division which saw him grab the title early on. However, Penn moved back up to the Welterweight division and challenged GSP for a re-match and a shot at the title. B.J. Penn’s corner conceded the fight at the end of round four after the doctor assessed the damage caused by a much larger GSP. Penn has called GSP a “cheater” ever since. All claims were dismissed as false and warranted no disciplinary action or further investigation. 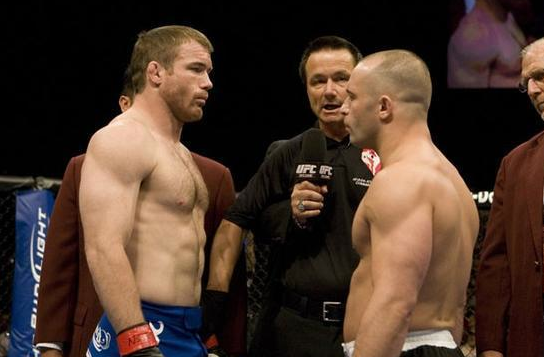 Whilst there was no bitter feud, it was this rivalry against Matt Hughes that made Georges St. Pierre into the best pound-for-pound fighter that we see today. Hughes and GSP met in the Octagon three times, each presenting a shot for the title. In their first meeting at UFC 79, Matt Hughes defeated GSP submitting him in the first round via an armbar. After admitting that he was intimidated by fighting his idol, he showed that this was no longer to be the case in their next two matches. GSP fought Hughes again winning both occasions; at UFC at UFC 65 by TKO stoppage and at UFC 79 in ironic fashion, an armbar submission. This entry was posted in More Sport, UFC / MMA and tagged BJ Penn, Chuck Liddell, Georges St-Pierre, GSP, Matt Hughes, MMA, Tito Ortiz, UFC, Ultimate Fighting Championship on July 9, 2013 by karenunchained. From the likes of an MMA elite such as Anderson Silva, to the face of the fight game’s largest promotion and president of the UFC, Dana White – you’re nobody until you’ve had yourself a good old-fashioned rivalry. While it hasn’t been an easy task sifting through the plethora of rivalries that have plagued the UFC over the years, in no particular order here are the top five most memorable ones. This rivalry all started when the two appeared on The Ultimate Fighter 4: The Comeback. Matt Serra a contestant and Matt Hughes a coach. On the show, Hughes boasted about his submission win over Georges St Pierre which set Serra into frenzy calling him disrespectful then hailing Hughes’ UFC Welterweight title victory a “fluke”. Hughes and Serra both agreed to Coach on The Ultimate Fighter 6 and soon after, the UFC confirmed that they would fight at UFC 98. Mac Danzig and Tommy Speer of Team Hughes made it into the finals leaving Serra’s coaching abilities to be questioned. The grudge match went the distance and Hughes won via unanimous decision. In his blog, Hughes said “When the fight was over, I was pretty confident I was going to get my hand raised. Some people have asked why I raised his hand at the end. Actually I didn’t, he raised mine. He also told me that, no matter what the decision was, he was done with the rivalry”. A gracious end to a rivalry, you say? Think again. Serra wants a re-match and still makes known his dislike for Hughes. There is no question about it, Anderson Silva is the best pound-for-pound fighter in the middleweight division. He was a force to be reckoned with and if there was one person to do that, it was none other than Chael Sonnen. Silva had twelve consecutive wins prior to his fight with Sonnen, he was indestructible, or so we thought, at least for a little while. 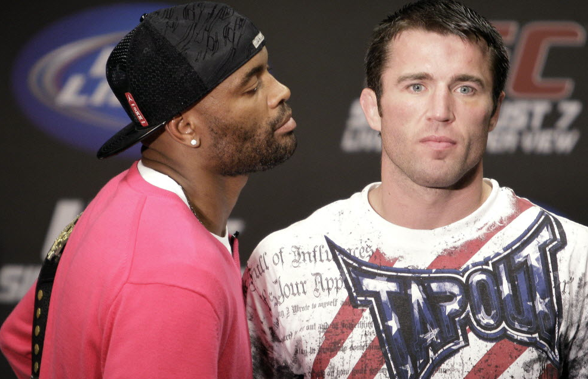 Silva was defending his UFC Middleweight title at UFC 117 and Sonnen shamelessly rocked Silva’s confidence throughout the whole fight. After landing a punch on Silva that would take him to the floor, Sonnen unloaded barrage of punches and elbows. This would similarly happen over the next four rounds. With only two minutes left of the fifth and final round, Silva took advantage of his position after ducking under a left hook and proceeded to put Sonnen into a triangle armbar leaving him no other choice than to tap out. Sonnen started with his trash talk on Silva again. His win over Michael ‘The Count’ Bisping allowed him to face Silva at UFC 148. Sonnen was unable to inflict substantial damage to the champ, and as a result Silva stopped Sonnen with a TKO in the second round. 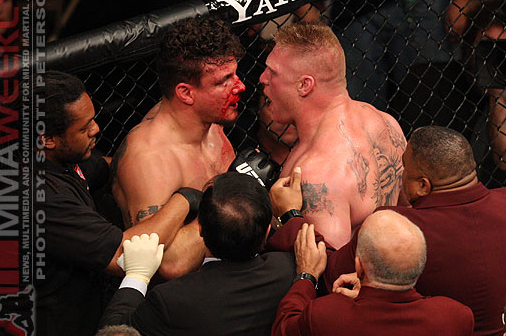 Brock Lesnar’s introductory fight into the UFC against Frank Mir was one that would keep people talking for many years and not because of the fight itself, but because of the rivalry between the two that would transpire afterwards. After a defeat at UFC 81 via a knee bar, Lesnar promised revenge, and he got it in a re-match at UFC 100. Nothing else to be said except, Lesnar simply destroyed Mir in round two with a series of hammerfists. Once the fight had ended, Lesnar proceeded to walk over to Mir, get in his face and scream at him. Both riled up, these two were not far off a round three. There was so much bitterness, that Mir went as far as saying that he hoped Lesnar would be the “first person to die inside the octagon”. Although the fights were one sided, the genuine animosity between Ken Shamrock and Tito Ortiz was one of the most intense the UFC has ever seen. It all began when Ortiz beat Shamrock’s Lion’s Den fighters (pre-Zuffa) and then proceeded to disrespect and taunt Shamrock. 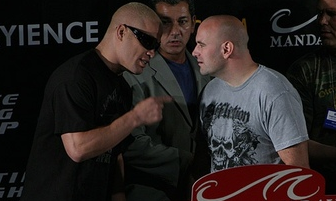 They exchanged a war of words, bringing them into the octagon to fight it out at UFC 40. It is safe to say that this fight attracted oodles of attention from UFC fans. Ortiz dominated Shamrock for the three rounds and won via TKO but it was not to end there. The two faced off again at UFC 61 and UFC fight night 6.5, again, both ending via TKO. Just to add fuel to the fire, Shamrock and Ortiz made a coaching appearance on The Ultimate Fighter – Season 3 where Ortiz managed to taunt Shamrock causing even more tension between the two. Although Dana White and Ortiz have never actually stepped inside the octagon, their feud has hands down been the most memorable in UFC history. Let it be known that once upon a time White and Ortiz were actually great friends. White was Ortiz’s manager and the two got along great, but that was to all come crashing down once Zuffa bought the UFC and White was put in charge to captain the ship. Once Ortiz made it into the UFC, White could no longer manage Ortiz due to legal reasons and was now essentially his boss. Ortiz felt betrayed. After a series of injuries which set his training back, Ortiz had not had a win since 2006 and his UFC contract was on the line. White had Ortiz in submission, if Ortiz did not win his fight against Ryan Bader at UFC 132, Ortiz would have to tap out his contract would be no longer. The only tap out that was made was by Ryan Bader in Round 1. Ortiz is safe and White has a new found respect saying “I’m totally impressed with Tito, I’m blown away that he beat Ryan Bader the way that he did.” So impressed, White gave Ortiz another chance to fight Rashad Evans at UFC 133 after Phil Davis pulled out due to injury. White, all praise for Ortiz went on to say “I’m even more impressed that Tito stepped up and took this fight [against Evans] the way that he did.” Have these two finally let bygones be bygones? What have been some of your favourite UFC rivalries? This entry was posted in More Sport, UFC / MMA and tagged Anderson Silva, brock lesnar, Chael Sonnen, dana white, frank mir, ken shamrock, Matt Hughes, Matt Serra, Rivalries, Tito Ortiz, UFC, Ultimate Fighting Championship on June 10, 2013 by karenunchained. 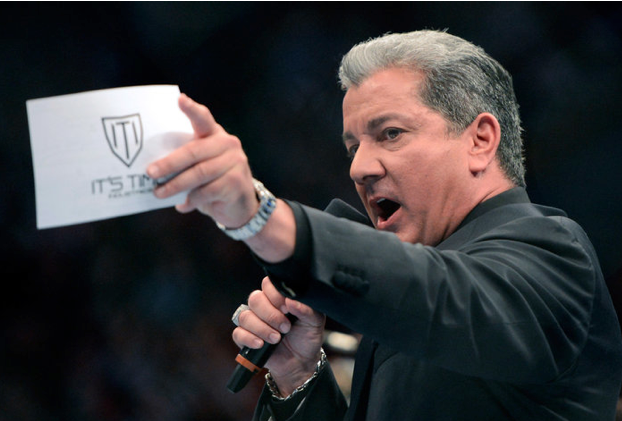 It is no wonder that after being the official announcer for the UFC over the last 15 years, Bruce Buffer is known as the “Veteran Voice of the Octagon”. His catch phrases such as “It’s time!” and signature moves like the “Buffer 180” are some of the best known and are mimicked by people around the world (including me!). Bruce has a humble and gracious presence in and out of the Octagon. He is one of the most highly respected names on the MMA/UFC scene. After having the chance to speak with him I can certainly vouch for that. 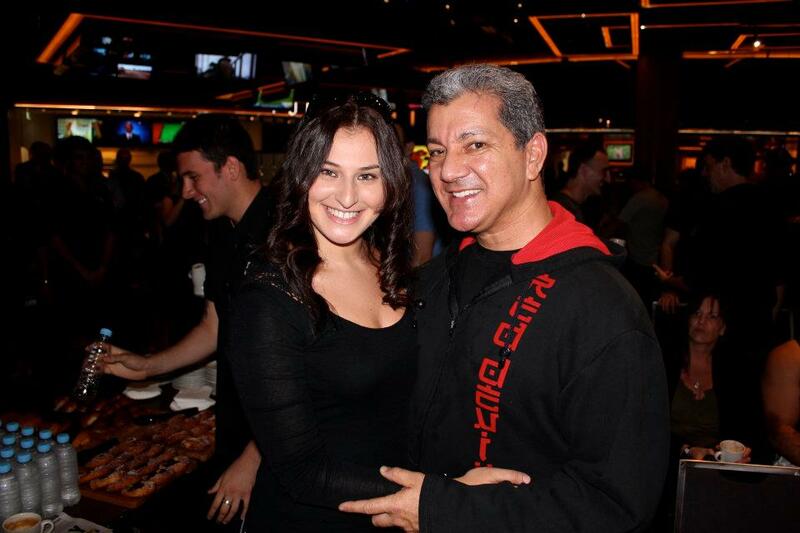 Long before he had any involvement with the UFC, Bruce Buffer was involved in martial arts, training in Judo at the age of 12 where he achieved a green belt. The legendary Chuck Norris came out to train his good friend Steve McQueen that he started to train in a Korean style of fighting called Tang Soo Doo. His training did not stop there. Bruce has not only trained in Muay Thai kickboxing, he has also been awarded a belt in Jiu-Jitsu. Although his passion and love for martial arts ran deep, Bruce never wanted to turn pro. He would have welcomed a chance to have one pro fight on his record but that dream was never to eventuate. As fate would have it, he has remained in the MMA industry, not as a fighter but as an announcer for the UFC. Bruce was kind enough to take some time out and speak with me to talk about all things MMA. So, without further ado and as Bruce would say “This is the moment you’ve all been waiting for,” and finally, “It’s time!” … Here is the interview you’ve all been waiting for. Thank you for taking the time out of your busy schedule to have a chat with me, it’s very much appreciated. The UFC returned back to the roots of MMA for UFC 134 in Brazil. How was that experience and did it differ from any other UFC events that you have attended? I’ve done every UFC event for the last 15 years and the experience in Rio was a historical experience that basically showed on an international level that we have gone to the next level and for many reasons. UFC 129 in Toronto where we appeared in front of 55,000 fans and the show sold out in a few hours. Now we have gone onto another level were we have a show in the historical birthplace of Vale Tudo and mixed martial arts in Rio de Janeiro, Brazil where we have 15,000 fans and the show sold out in 77 mins. Those 15,000 fans sounded like 50,000 fans. What was even more spectacular and blew me away was when I went into my “It’s Time” during the Main Event, the entire arena recited back to me at the exact same time with my inflection – “It’s Time”. It was is amazing because I have never seen that happen with any announcer in sports anywhere. The fact of the matter is that this was a country where people don’t speak English and yet they are talking back to me in English. It was an amazing, amazing compliment. You started announcing at UFC 8, how did you get involved? I originally managed the career of my brother, the famous “Let’s Get Ready to Rumble” announcer, Michael Buffer. I was putting Michael into every area of sports and entertainment back then as I still do today. I called the UFC and arranged for Michael to announce UFC 6, 7 and Ultimate Ultimate. We had a conflict of interest with WCW wrestling league and therefore I couldn’t have him announce anymore due to the fact that he had such a huge contract with WCW. I tried to get them to hire me at that time but they wouldn’t. I thought, “how do I do I get this to happen and how can I get the attention of the owner Robert Myer”? Therefore, I managed a fighter named Scott “The Pit Bull” Ferrozzo in the UFC 8, Puerto Rico. When I was flying down to Puerto Rico I called the owner and I said “look, I’m bringing down my tux, let me show you what I’ve got and let me announce the preliminary fights”. So he let me come down and announce the preliminary fights at UFC 8. They didn’t hire me after that. They called me back for UFC 10 on a two-day notice, which I went and did the entire show, I thought they would hire me after that but they didn’t. I then got a call from the UFC asking me if I wanted to be on the hit US TV show Friends and co-star as myself as the announcer for the UFC. I agreed, but when I got them on the set I told them that I have tremendous media contacts and that I have been helping promote the UFC. I wanted to promote it to be one of the biggest things that has ever happened in sports, but in order to do that properly and to keep my passion flowing, I wanted to be the announcer and I want to announce every UFC. There I was on the biggest comedy hit network TV show in America. John McCarthy and Tank Abbott were on all co-starring as ourselves, people were going to think I was the ring announcer. Why not make sure that I am the announcer? He agreed with me and we made a deal right there. It was the best poker hand I ever played in my life. You’ve just spoken a little about your brother, Michael. What is your relationship like with him? Very strong. Michael and I are long lost half-brothers. We met about twenty five years ago and four years after that I took over Michael’s career and started managing him. I believed the famous five words needed to be trademarked properly and that there were avenues to create toys, video games and other ventures in movies and TV, which has never been done and nobody tried to do. So, I put that all together. We have had an incredible partnership, and my management to him has been great for all these years. I recently did an article on UFC rivalries. In all your years, which rivalry has been your favourite? There is a couple that are fun to watch but I like the rivalries that talk crap about each other and get on each other’s nerves. I like it when it is for real because then I really know it is meaningful. 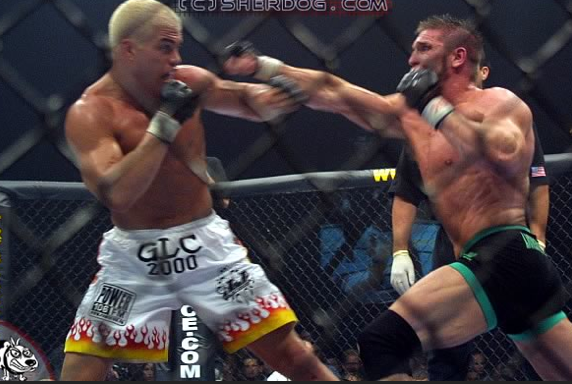 One of the most classics of all time is the original fight between Ken Shamrock and Tito Ortiz. That was one of the best rivalries I have ever seen. From the trash talking to the promotional aspects of it to the way the fight panned out that night at the MGM Grand in Las Vegas, which is probably at that moment a historical moment. It was again, the highest energy of crowd participation that I have seen at the UFC to date. The UFC had a few incidents with fighters and hormone replacement therapy. What is your opinion on that and any form of illegal substances in the UFC? I don’t condone it at all. I think if you are out there to perform you are out there to perform with your God’s gifts that you were given at birth. Its the way you train, the way you develop and the way you mature yourself as a fighter and as an athlete. I think it should be on an equal playing ground all the way around so I am completely for drug testing and completely for those items being banned. I don’t think they are healthy for a fighter because one thing that a lot of these things do are give you bursts of energy but they don’t give you long term energy for what you need to go through a five round fight. It’s not fair for somebody to have that advantage over somebody that is training hard and working with their natural talents. You obviously travel a lot which would take its toll, how do you keep fit and more importantly is there anything special you do to keep your voice the way we hear it at each event? I have been an athlete my whole life. I eat healthy and I train regularly. When it comes to my voice, I have a couple of little things I use; if I am in a spa area like Las Vegas, I love to take a good steam during the day which is great for your throat. I make sure I don’t damage my throat with anything like smoking. I do the best I can to keep my throat healthy. When I am at the show, I always keep a cup of pure honey right beside me and a simple half teaspoon of honey does the trick. It soothes the vocal chords and it’s one of the best things you can do. Other than that I have done shows sick, I’ve done shows coming out of laryngitis, I’ve done it with a 103 degree temperature, I’ve done it with a blown ACL, I’ve done it with a sprained back . My adage is that the show must always go on. I am not fighting, so I don’t have anything to complain about. Those guys deal with a lot more than I do as an announcer and there is no reason I can’t perform every night that I am there. Well, I for one love and appreciate your commitment. I think you are absolutely fabulous and I have been a big fan of yours for a very long time so I would like to say thank you! I often find myself having to defend MMA to people who are uneducated. They claim that it’s too barbaric or whatever the case may be. If there was anything you could say to those people, what would you say? When I get into this situation with people and a lot of that comes from pure ignorance. Perception is reality, so if they are in the 18 – 34 age group the first thing I ask them is “do you enjoy boxing?” and if their answer is no then they just don’t like fighting so I don’t really try to take it to any other level. If they are interested and want to know more about it, then I will answer their questions. If they are into boxing the next thing I say is “Have you ever watched an entire UFC event – not the old days but recently?” If they say no, then they have nothing to work from so what are they talking from? They need to watch one show and then I can have a conversation with them otherwise they are talking out of ignorance. I think if you are a fight fan even in the world of boxing, you become totally addicted to it. Boxing is a grand sport and I am a huge fan. Marquess of Queensberry rules, two weapons, it’s an art to itself. They are two separate forms of fighting and they are two separate sports. In the MMA field you are dealing with over 40 weapons, so it is a matter of understanding but also at the same time, if you watch a UFC, you see such exciting fights unless you are unwilling to change your opinion like Jim Lampley [HBO commentator], who will not do anything to change his opinion because he doesn’t want to. Then you talk to a boxer named Bernard Hopkins who is one of the greatest boxers of all time. He recently attended the UFC, [and] was previously talking down on the UFC making very derogatory remarks and not accepting of it. When I saw him at the fight he said, “You know what changed it for me? I trained with the fighters. These are the greatest fighting athletes in the world. a boxer will not survive in the Octagon as well as an Octagon fighter Champion will not survive against a champion in the squared circle of boxing”. I fully agree with him there. There are exceptions to the rule, but as a rule boxers will not win an MMA fight and a Champion MMA fighter will not win against a Champion of boxing. So it’s just where you are coming from. I don’t want to explain to hard. If they are interested, I love talking about it. If they are not, it’s a waste of time. That’s generally the approach I take. At the same time, I do my best to try and at least educate them a little bit about the sport, but sometimes you just can’t change people’s minds. If they’re not willing to be open about it, so be it. We do that out of passion and a love for the sport, but again, it all depends on the individual that we are talking to. Thank you again for your time Bruce; it has been a pleasure talking to you. You’re very welcome Karen. Make sure you come and say ‘hi’ to me when I’m next down there [in Sydney]. Absolutely. I look forward to it! This entry was posted in More Sport, UFC / MMA and tagged Bruce Buffer, Interview, Michael Buffer, Mixed martial arts, MMA, Octagon, UFC, Ultimate Fighting Championship on June 10, 2013 by karenunchained.